Set your sights further afield. 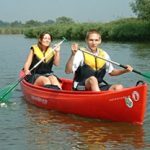 Available to hire from 3 days to a full week, you’ll have plenty of time to explore the Norfolk and Suffolk Broads in our luxurious holiday cruisers. You could go all the way to the city of Norwich without crossing Breydon Water. Though, if you did choose to cross Yarmouth into the Northern Broads, yet more exploration awaits. Our boats range from two all the way up to six berth, so we’re sure you’ll be able to find what you’re looking for. Please note that our Andromeda cruiser comes in two varieties – there is a pet friendly and non-pet friendly version.